Safemeds4all Recognises that prescription medication should only be sold with a VALID PRESCRIPTION from a local physician, who has physically seen the patient. On our website if any user is purchasing a Prescription drug , which requires a Prescription. The Customer / patient should provide us with a VALID COPY of the prescription from his or her own doctor in his or her local area. The prescription can be faxed to us or emailed to us. If the patient is unable to provide the prescription within 5 days from the date of placing the order, the order will be cancelled and the refund will be initiated to the account. 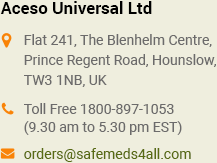 We will not dispatch the order unless a Valid prescription is received by us.